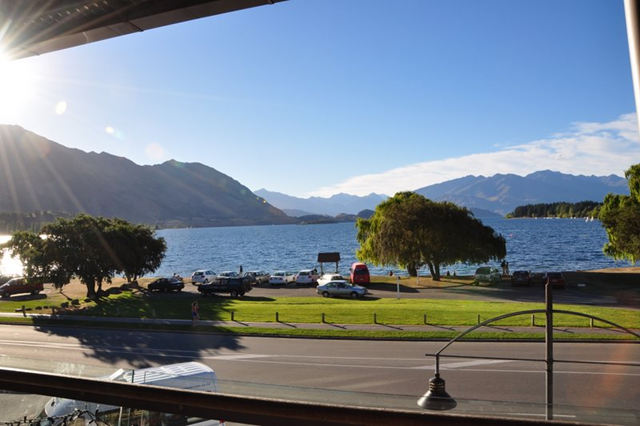 We arrived in Wanaka late in the afternoon and after settling into our hotel we headed down to the lake for a lovely stroll. There is a small strip of restaurants that face out over the lake. We checked out a bunch of different menus and chose to eat at The Reef Seafood Restaurant & Bar. After a quick climb up the stairs with the stroller in tow, we were promptly seated at a table on their outdoor, covered balcony. The views out over the lake with the mountains in the background were amazing! It was the perfect setting for what proved to be a lovely dinner! Ian ordered the Fish of the Day, $26NZD, which was monk fish on the day we ate there. He had a choice of breaded or battered. He chose breaded and wasn’t disappointed. 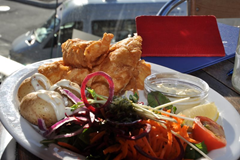 The breading was very light and not heavy and the fish was served with a nice tossed salad. 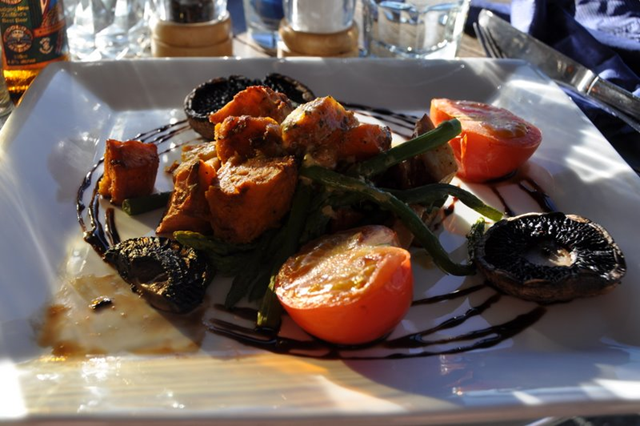 Wendy ordered the vegetarian option – in this case a Stacked Portobello and Vegetables. There was a wide variety of roasted vegetables: tomato, potato, sweet potato, asperagus, little portobellos, carrots, kumara (a native potato-like vegetable) and turnips. They were all drizzled with a flavorful sweet and savory sauce. The dish came with naan which was passable but had oddly crispy parts. We were reluctant to leave the beautiful setting, so we decided to cap off dinner with some dessert. Ian had a cappuccino, naturally. Sadly, he was not impressed. There was not enough foam and the coffee itself wasn’t up to his standards. We split a Chocolate Torte, $9.50NZD. 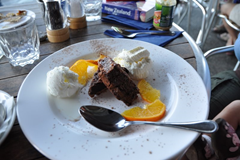 It was a reasonably good flourless cake with Gran Marnier and served with a pleasantly fresh whipped cream and some passable vanilla ice cream. The garnish of orange slices was a nice touch, but the cake just wasn’t chocolaty for our taste. Ok, we couldn't choose between this and the other view shot. What can we say? The view of Lake Wanaka is amazing! 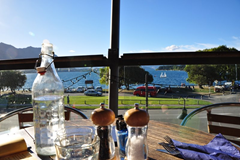 Overall, the setting, with that fabulous view, more than made up for any shortcoming of the food. The service was prompt and friendly and we would happily return!